Museums as Agents of Change is an 18 month partnership project between National Museums Scotland and Museums of Malawi, funded directly by the Scottish Government. The project was designed to deliver training in a variety of museum skills and to update exhibitions and displays at the National Museum in Malawi. In November 2012 I was appointed to run the project and it has been a fascinating experience. 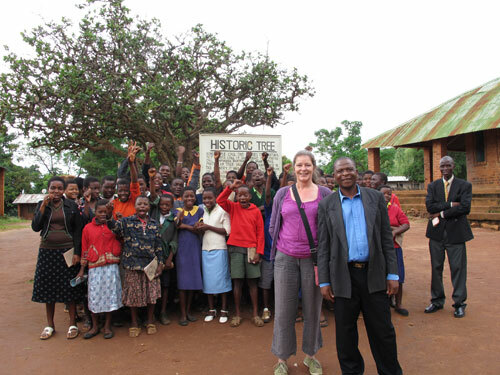 In early 2013 I travelled to Malawi for the first time to meet our colleagues in Blantyre, Malawi. I was made very welcome and myself and my colleague, Phil Howard, our taxidermist, travelled with them all to Liwonde National Park to carry out our first workshops. Phil Howard and students in Liwonde National Park. In April 2013 four key staff from Museums of Malawi made the return trip to Edinburgh for two weeks of intensive workshops. However, they did get the chance to explore Scotland at the weekend when we visited the other Blantyre, birthplace of Dr David Livingstone, the man who started the special relationship that exists between Scotland and Malawi. Museums of Malawi staff at the David Livingstone Centre, Blantyre. After visiting the National Museums Scotland Dr Livingstone exhibition and his birthplace museum, on their return to Malawi the team started preparing for a new Dr Livingstone exhibition for their own museum. In September 2013 I travelled back to Malawi to assist with the installation. This was the biggest display project the museum has undertaken since it was built in 1966 and the transformation has been remarkable. The exhibition was opened on Tuesday 17 September 2013 by the Minister for Tourism, Wildlife & Culture. The opening was also attended by the Deputy British High Commissioner and over 200 invited guests. We were treated to performances by cultural dance troupes, poetry readings and short plays by local schools. Visitor numbers at Chichiri Museum have increased by 35% in the 3 months since the opening. The new exhibition at Chichiri Museum, Blantyre, Malawi. Traditional musicians and dancers at the opening event. After the exhibition opening it was back to work with some more training on collections care, looking at security and environmental monitoring. I was also fortunate to be invited to the City of Stars arts conference and festival in the capital, Lilongwe. This was an excellent opportunity for everyone working in arts and culture in Malawi to share experiences and ideas. As usual in Malawi, there was a large Scottish delegation including the National Library of Scotland, Scottish festival directors, film makers and musicians. After the conference and four weeks of hard work it was a luxury to enjoy the City of Stars music festival on Friday and Saturday nights. There was music from the Malawi Mouse Boys (who featured on our exhibition film), Scottish band Bwani Junction and a choir from the Tilinanu orphanage, as well as many others. The last phase of our project was delivered in February 2014 when two colleagues and I returned to Malawi. Jennifer Reid was running more collections workshops, Phil Howard returned to finish his taxidermy training and I was helping update the natural history displays. Jennifer was leading a workshop on care of natural history collections, which meant a week in the stores dealing everything from snakes in jars to elephant bones. Staff carrying out an inventory of the collections in store. The new taxidermy was installed in a refurbished showcase and the display enhanced by some hands-on interactives. The new natural history display. Skulls and horn hands-on interactives. It has been a hugely successful project with staff from both organisations learning from and supporting each other. Although our project has come to an end, Museums of Malawi and National Museums Scotland continue to have a connection through our shared history and collections. The Museums of Malawi and National Museums Scotland staff at the end of the workshops. The final event in the formal partnership project took place on 31 March 2014 when the National Museum of Scotland hosted the Scotland Malawi Partnership Youth Congress. It was a fitting final event, with its theme of inspiring a new generation to get involved in supporting projects in Malawi. What are these four conservators so busily repairing? A net for catching antelopes! This interesting object is part of the new temporary exhibition Dr Livingstone, I presume? currently on at National Museum of Scotland. The net was collected by Livingstone himself and is one of a number of objects in the exhibition which were sent back from Africa to what was then the Scottish Industrial Museum, now the National Museum of Scotland. Working on the antelope net in the conservation laboratory. The South African net is made from the bark of the baobab tree (probably Adansonia digitata). One of the most versatile trees in Africa, the baobab is a source of food, water, fuel and much more, including plant fibres used in the making of cordage. 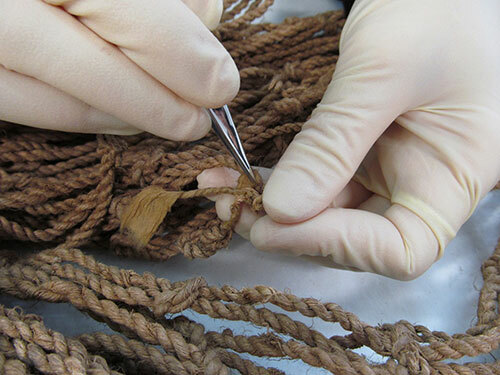 The bark has been processed to form 2-ply S-twist cords, which have been knotted in turn to create the net’s structure. The entire object is over 3.5m in length and 1m in width. 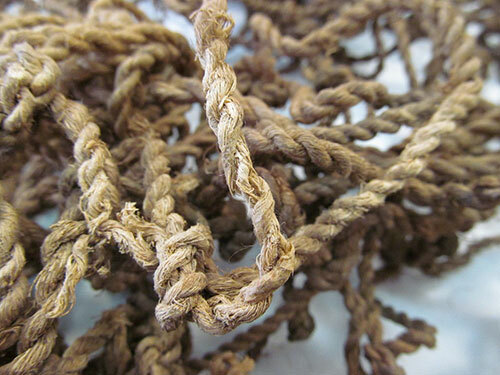 When the net was examined in the lab, it was discovered that many of the cords were completely or almost broken, a condition likely resulting from use. One of the many damaged cords. 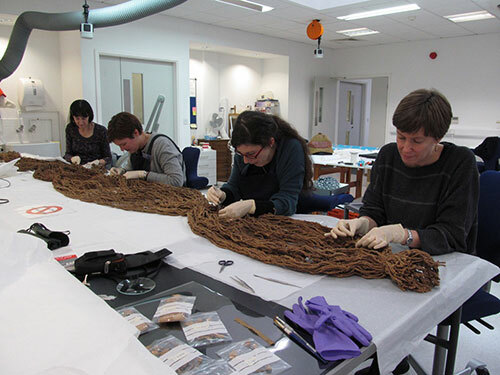 Two Textile Conservators and two Artefact Conservators then put their heads together to devise a method for repairing the damaged cords. After testing out a few different materials and techniques, we decided upon using paper twists to replicate the cords. The paper chosen to form the twists was a Japanese mulberry or kozo paper, which is made from the long inner bark fibres of the paper mulberry or kozo tree (Broussonetia papyrifera). 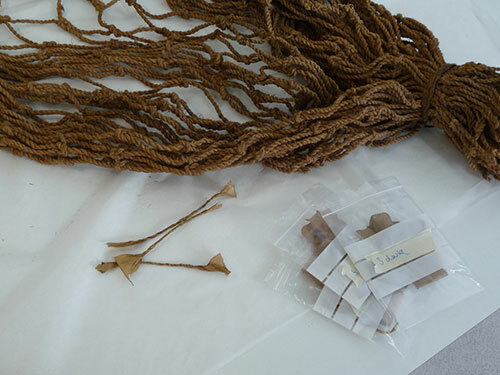 Mulberry paper is a popular repair material in conservation as it has considerable strength because of its long fibres, is chemically stable and available in a variety of weights. 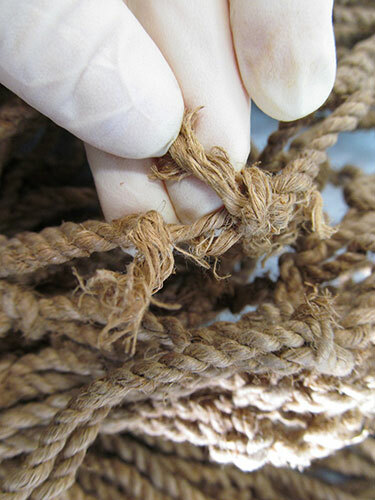 Strips of three different thicknesses were first cut with feathered edges to reproduce the varying cord diameters found in the net. 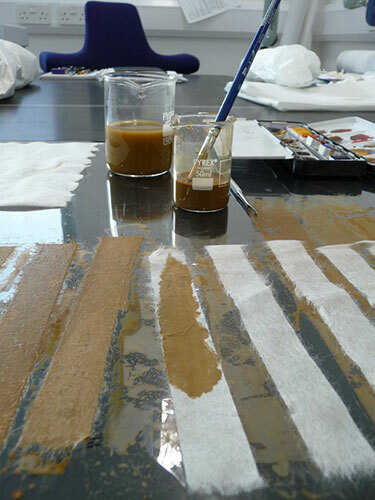 The paper was then toned with watercolours to produce three different shades of brown. Toning the Japanese mulberry paper strips with watercolours. 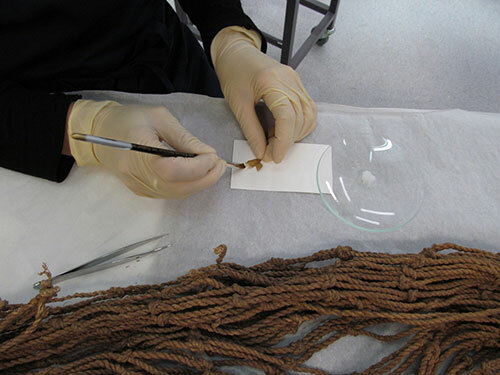 Once the shade and thickness of the paper was matched to the cord to be repaired, the conservator created the twist with her fingers, wound it around the damaged cord, and secured it in position with wheat starch paste. Twisted paper strips ready for use. Applying the wheat starch paste. Securing the paper twist to the damaged cord. After the repair of around fifty damaged cords, the net was finally stable enough to go on display in the Livingstone exhibition! One of the mended cords. 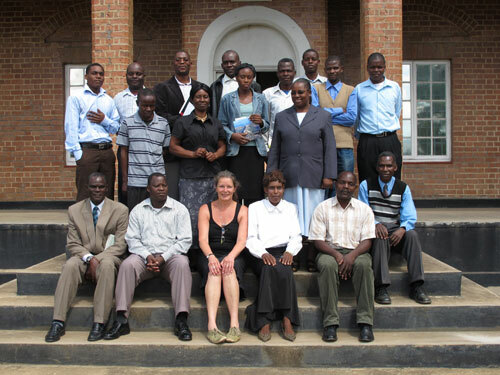 In April 2012 I spent three weeks working with staff from Chichiri Museum, Blantyre, in Malawi. It was my first time there and I was continuing our partnership work with Museums of Malawi. Scotland’s connection with Malawi goes back to Scottish missionary and explorer David Livingstone’s arrival there in 1859. It was this connection that I was particularly interested in following up as we are planning a special exhibition at National Museum of Scotland from 23 November 2012 to 7 April 2013 to commemorate two hundred years since his birth in Blantyre, Lanarkshire in 1813. Sarah with the Chichiri Museum staff. We had a busy schedule to make the most of my time there and, together with a film crew from Malawi Broadcasting Corporation, we travelled throughout the country filming interviews with historians, clergy and officials to record what people in Malawi think about Livingstone today. We also filmed historic sites associated with Livingstone’s travels through the country, which are recognised as national monuments. This footage will be seen in the exhibition and will also be used for an MBC TV documentary. 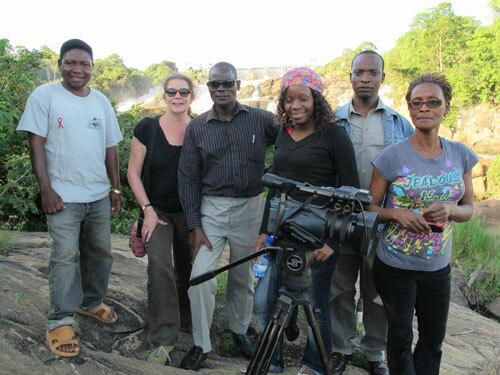 On the road with the Malawi Broadcasting Corporation crew. I also took the opportunity to visit different museums to find out more about the role of the museum in Malawi to share with my colleagues at National Museums Scotland. This will help us identify areas for development of the partnership, including skills sharing and knowledge exchange. Fieldwork is also a wonderful opportunity for curators to add to the collections. I brought back a range of objects including specialist wooden carving from the Mua Mission in Central Malawi and chitenje cloths decorated with political slogans worn by women across Malawi. Sarah with staff and pupils from Mbame School. The visit was a great experience and really productive. For me, the development of existing relationships and forging new links with the museum staff is one of the lasting outcomes and I look forward to continuing to build on this, sharing ideas, skills and plans for the future. At the beginning of October, National Museums Scotland welcomed Acting Director Lovemore Mazibuko and Mike Gondwe, Education Officer from Museums of Malawi. They were here to discuss plans for working together on a forthcoming special exhibition in 2013 to commemorate the birth of Scottish missionary and explorer David Livingstone 200 years ago. Livingstone was the first European to document Malawi in the mid 1800s and continues to be remembered as an important figure in Malawi. During the week we successfully identified a number of potential collaborative projects which will enable our exhibition to reflect the legacy of Livingstone in Malawi today. In a packed programme of meetings and talks, Lovemore and Mike visited Conservation, Digital Media and Collections Management to discuss the development of a new national museum in Malawi and the potential for collaboration in the future. We also dropped into a schools session working with our African handling collections. Impressed with our new Education Suite, Mike pointed out to the class how lucky they were, as in Malawi his sessions were for classes of 200 who didn’t even have access to paper or pencils. 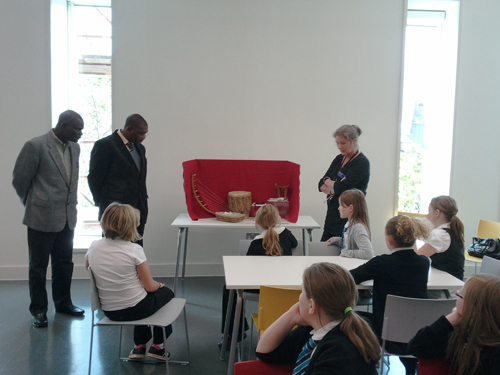 Mike, Lovemore and Sarah drop into a schools session in the Learning Centre at the National Museum of Scotland. Their visit would not have been complete without a day at the David Livingstone Centre in Blantyre, Lanarkshire (a major lender to the exhibition), but there is no doubt that the highlight of the visit came when we managed, at the last minute, to arrange a personal greeting with HRH Princess Anne, who was visiting he museum to open the special exhibition Admiral Cochrane, The Real Master and Commander. Lovemore and Mike’s visit is, I hope, the beginning of a rich and fruitful partnership between National Museums Scotland and Museums of Malawi, continuing in 2012 when I visit Museums of Malawi and, with their help, collect content for the exhibition in film, photos, points of view and objects. I will also be looking to see how we can share some elements of the exhibition with those in Malawi celebrating the bi-centenary of Livingstone and establish a more lasting collaboration.